I've been skateboarding for a long time, over half my life actually. And through all those years, there is a big lesson I wish I had learned earlier, because it could have saved me countless hours, pain and heartache. The tragedy of it is, though I know it to be true, I just can't seem to act it out consistently! And that big lesson is: put your feet down. Let me explain: fear plays a big role in skateboarding. When you're hucking yourself down sets of stairs and trying to balance on rails that could potentially end your ability to bear children, naturally there is an element of fear involved. Fear, when acted out in kicking your board away (bailing) eventually turns to habit, and habits are hard to break. For years I would try the same trick, over and over and over, kicking the board away every time. Sometimes it was justified -- I didn't clear the gap or the board wasn't under both feet -- but often times I could have landed the trick by just simply putting my feet down. But the fear of landing wrong and the habit of bailing has kept me from many moments of glory, and resulted in a lot of injuries. The funny thing is, when you're trying a big trick, it's usually better to just put your feet down than to bail. Your board is better suited to take the impact of your fall than your feet are, and even if you don't land the trick all the way, you will likely be closer to landing and safer than if you simply bail. There was a time in my life when I was able to overcome this obstacle though. 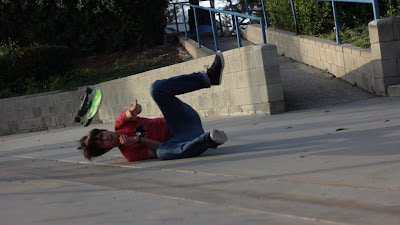 It was right after high school, and what I regard as the peak of my skateboarding abilities. Something clicked in my brain and I realized that ignoring the fear that leads to bailing often ends in success. It took about five years to learn, and about five months to forget. You see, the habits of bailing were long rooted in my skating, and so this brief period of push back only lasted so long. The lesson was once learned, but now, years later, I still struggle with putting my feet down. Sometimes it happens, sometimes it doesn't, but I can't help but ask myself why something that makes so much sense is so difficult to achieve. Maybe read that one twice because it's a little confusing. Basically, it's just like my skateboarding: I know it's better for me to put my feet down, but I can't seem to make myself do it! Even as I write this blog post, both my kids are crying and my wife is exasperated, so I need to put my own needs on hold -- but this comes with complaining and a bad attitude as selfishness and disappointment take control. Sometimes I can check the attitude, and sometimes I can't, just as I sometimes land tricks the first try, but sometimes it takes hours. But the main problem is that I'm not consistent. It's a simple act that we can do, which still depends on Someone who is stronger than we are. I don't know if it will help me land skateboard tricks, but it will certainly help me in ways far more significant and longer lasting. *Note: I got this last bit from Max Lucado's book, No Wonder They Call Him the Savior. It's old, but still relevant and very easily digestible. I highly recommend it.